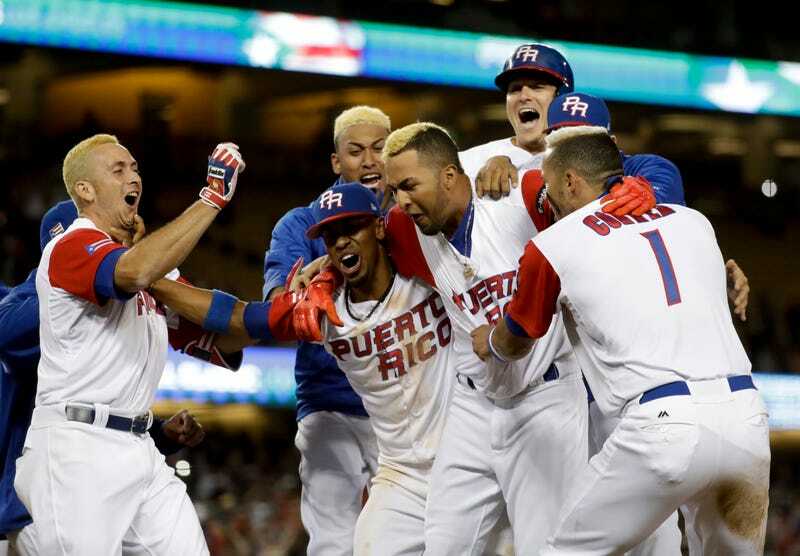 Puerto Rico walked off with a win over the Netherlands in the WBC’s first semifinal in a game that was wild and wildly entertaining from beginning to end. It provided a look at what baseball could be—and what it already is in some places, when freed from MLB’s hidebound propriety. The sport could be full of bat-flipping, chest-pounding, unwritten rule-breaking excitement—we could actually allow and encourage players to have fun playing it, and to display their joy, and to make it a more watchable experience for everyone. Celebrate their celebrations, instead of punishing them with a fastball in the neck. Here’s that walk-off, an 11th-inning sac fly by Eddie Rosario that scored Carlos Correa. For the Netherlands, another fantastic international showing, their second straight trip to the semis at the WBC. But Puerto Rico truly looks like the team of this tournament. Paced by the bats of Correa, Javy Baez, Francisco Lindor, and Yadier Molina, Puerto Rico is 7-0, and will face the winner of tonight’s second semifinal between Japan and Team USA.